The time has come for Nigerians to begin to question the sanity of mind of the man, behind the controversy currently pervading the Nigeria House of Representatives. While the antecedent of the arrow-head of this ignoble conduct may not be hidden to some, let me also remind the public who have followed the turn of events about the character called Abdulmumin Jibrin and why someone of his kind, should never be taken serious when issues of public importance and trust, is to be determined. Every sane minds have continued to ask Jibrin, if the same Budget he superintended over as the Chairman of the House Committee on Appropriation is the same that he is currently attempting to tear down before the Nigerian public. It is no doubt, that His removal as the Chairman of the Committee was based on sundry acts of misconduct, incompetence, immaturity, total disregard for his colleagues and abuse of the budgetary process, among others. It should also be noted that one of the fundamental reasons why the house leadership removed him is that he was found not to be fit and proper person to hold such a sensitive office, which exposes him to high officials of government at all levels. Furthermore, it has been revealed that in the course of the performance of his duties as chairman of appropriations committee, it became evident that he does not possess the temperament and maturity required for such a high office. From time immemorial, Jibrin has the tendency and proclivity to blackmail colleagues and high government officials, and misuse and mishandle sensitive government information.He was in the habit of collating, warehousing and manipulating sensitive information to blackmail people sometimes apparently for pecuniary purposes. Recall that sometimes in 2002, Jibrin and some known Youth and Students’ leaders formed a group known as Grand Alliance of Nigeria (GAONI), an organization he used mainly for his personal enrichment until he was unceremoniously removed as the leader of the group. His exploitative tendencies took him into business and political partnership with many several members of the political class, where he used companies registered by him, to embark of several unexecuted contracts and money laundering. At a time he was preparing to contest his first election into the House of Representatives in 2011, the numerous scandalous activities of Abdulmumin Jibrin have gotten to a peak as he was then nabbed and arraigned by the EFCC in a 50-count corruption charge against the former governor of Nasarawa State, Aliyu Akwe Doma, in the looting of public fund to the tune of N15 billion, having used his company, Green Forest, to consult for the Doma-led government in Nasarawa State. In pure exhibition of his arrogance and rascality, Jubrin in December 2013 walked the then finance minister, Ngozi Okonjo-Iweala out of a meeting the House committee on Finance was to hold with her on the state of the economy in preparation for the consideration of the 2014 budget. 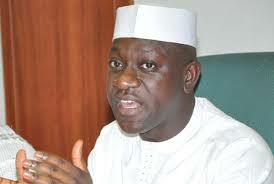 Jibrin’s outburst at the time followed an altercation with the minister. He immediately handed the minister 50 questions on the true state of Nigeria’s economy. When Mrs. Okonjo-Iweala eventually responded to the questions, Jibrin in his overbloated ego, rejected her response and asked her to re-answer. There is no doubt that his latest adventure is just one of those numerous “bad jobs” he specializes in doing for political bidders, who main target is the removal of Honorable Yakubu Dogara led leadership of the House. Let me finally remind Abdulmumin Jibrin that once a budget is signed, it becomes a law. You cannot Investigate a law, you can only challenge it in court. I strongly know that Jibrin is only acting a script to get Hon. Yakubu Dogara out and this must be resisited by every Nigerians of good conscience. Idris Usman is a social commentator based in Kaduna. This entry was posted in News and tagged Abdulmumin Jibrin and the frustration of an unstable Mind- Idris Usman. Bookmark the permalink.